After making the Slow Cooker Roasted Red Pepper & Goat Cheese Soup, I wanted to try recipes for more veggie and cheese soups. I decided mushrooms, cauliflower and white cheddar would make a tasty combination. It reminded me of fondue! You can use any white cheeses you like (parmesan, gouda, etc. ), and if you like, you could replace 1/4 cup of the vegetable broth with dry white wine, like in this similar recipe from closetcooking.com. 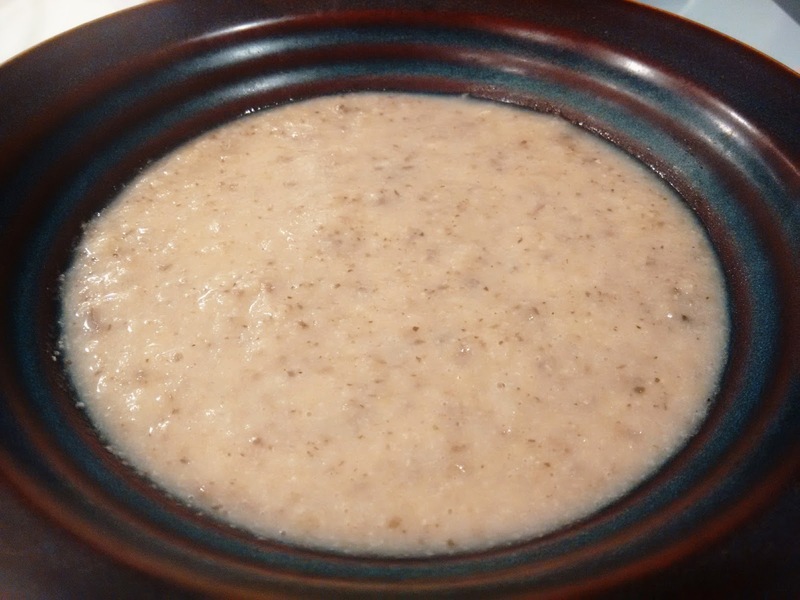 Cauliflower adds thickness to the soup, so when it is blended, it can replace heavy cream. It is my new favourite soup ingredient! Note: I blended the soup after adding the cheese, which made the immersion blender a little harder to clean, so if you prefer easier clean up, blend the veggies first, then stir in the grated cheese. Cauliflower is high in potassium and vitamin C, and contains 2g each of fibre and protein per 1 cup serving. Mushrooms are also high in potassium, as well as copper and phosphorus, which aid in skeletal health and bone density. Leeks, garlic and artichokes contain soluble fibres, such as inulin, that are classified as prebiotic, which means they promote the growth of healthy bacteria in the colon. Place cauliflower florets in the bottom of the slow cooker pot, followed by mushrooms and marinated artichokes. Season with thyme, onion powder and black pepper. Add leeks and garlic on top, then pour vegetable broth into pot. Cook on high for 4 hours. When there is 10 minutes remaining on the cooking time, remove the lid, stir in grated white cheddar. Replace the lid. When cook time is complete, remove the lid, and blend the veggies and cheese with an immersion blender (or see note above).